indigo: Documentation generated on March 17, 2019 at 10:22 AM (doc job). jade: Documentation generated on May 01, 2017 at 10:29 AM (doc job). kinetic: Documentation generated on March 16, 2019 at 10:15 AM (doc job). lunar: Documentation generated on March 17, 2019 at 10:16 AM (doc job). melodic: Documentation generated on March 17, 2019 at 10:17 AM (doc job). 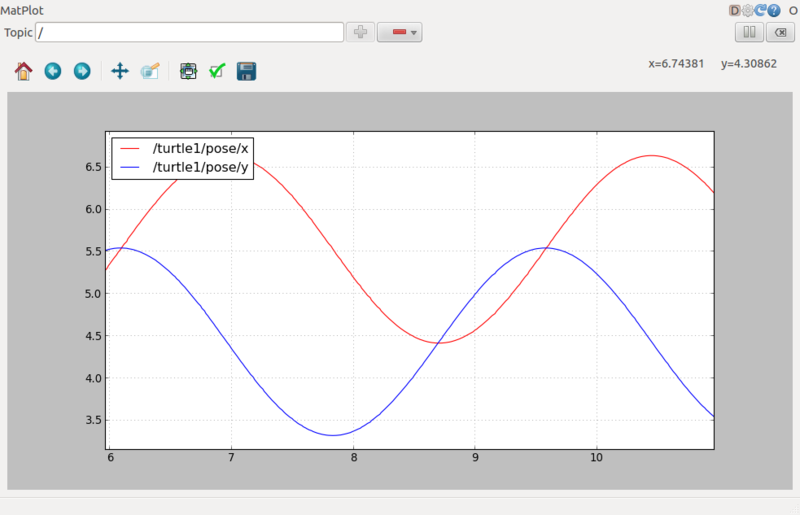 rqt_plot provides a GUI plugin visualizing numeric values in a 2D plot using different plotting backends. /rosout         #  these are only example topics. There are two ways to give the topic names to rqt_plot as explained in following sections. In both ways, topics that are set in previous run is resumed (as far as the program was shut down without error). Both of the following lines plot the same topics. Obviously, if you want to change the topics to plot, you need to restart the program and give the new topic names. Type in the "Topic" input field the full path of the topic name, and press "+" button. "Topic" field auto-completes the topic name (although it's not fully working as noticed). The input value should be the full path to the value, not only the topic name. E.g., in above case the topic /turtle1/pose/x is a member "x" in a published topic "/turtle1/pose", which is defined as "turtlesim/Pose" message. geometry_msgs/Pose contains a member position. Look into its definition by clicking the link at geometry_msgs/Point in the api page. You see x as a member of geometry_msgs/Point. By default, backend option is chosen in the order above; the first one found on your system gets used (eg. if your system has matplotlib but not pyqtgraph, your rqt_plot runs with the matplotlib). User can also select one of them from GUI; click "gear" icon next to question symbol and a dialog should pop up. Use rqt_topic to see the topics being published. You are plotting data from a bag file? Spline curve is not supported either.